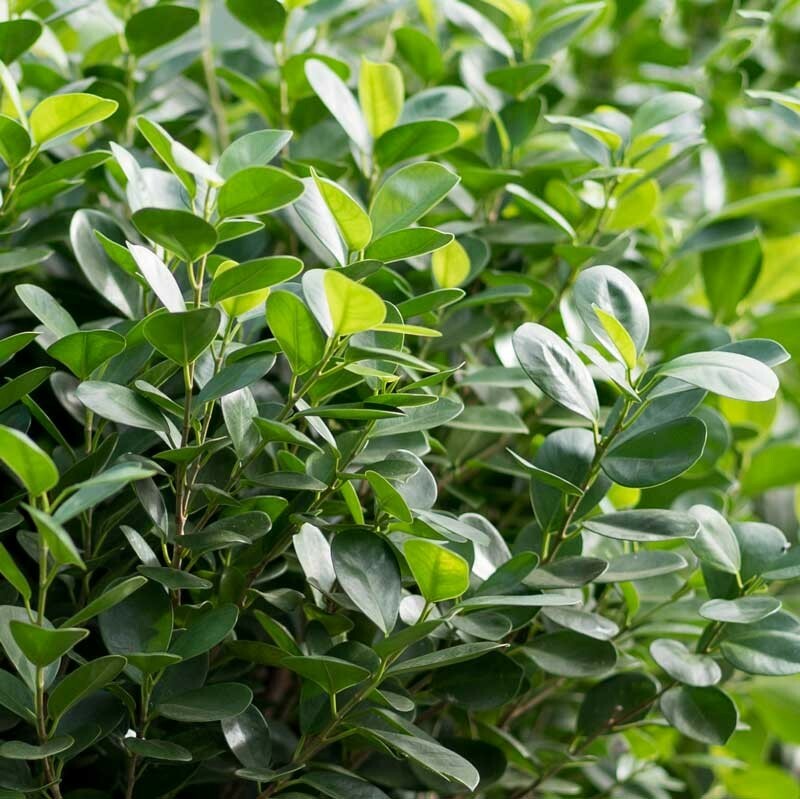 The Ficus "Moclame," pronounced like the hero of the cinema classic Die Hard (also known as Ficus microcarpa), has a bushy appearance that is expressed through its abundance of small, oval leaves. Being a high light plant, the Ficus Moclame prefers bright, indirect light with regular waterings and a dry-out period in between. The small branches of this tree are most conducive to hedge pruning, and with patience its outward appearance can be highly controlled. 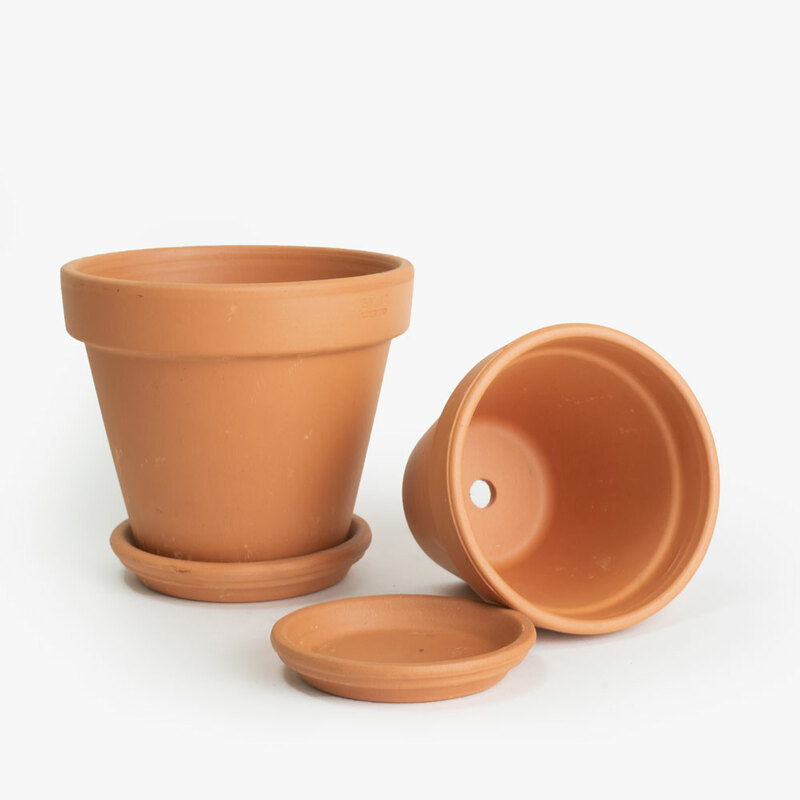 This simple matte planter contains a water reservoir that supplies water to your plants as needed which allows for longer stretches of time between watering meaning less maintenance for you. You can easily monitor the water reservoir levels with the planter’s water-level indicator, which shows when the reservoir needs to be refilled. Measures 16.6" W × 15.6″ H. Will fit a plant in a standard 14" nursery pot. The Washed Fiberclay Series is made of fiberglass combined with cement, sand and finely ground stone. 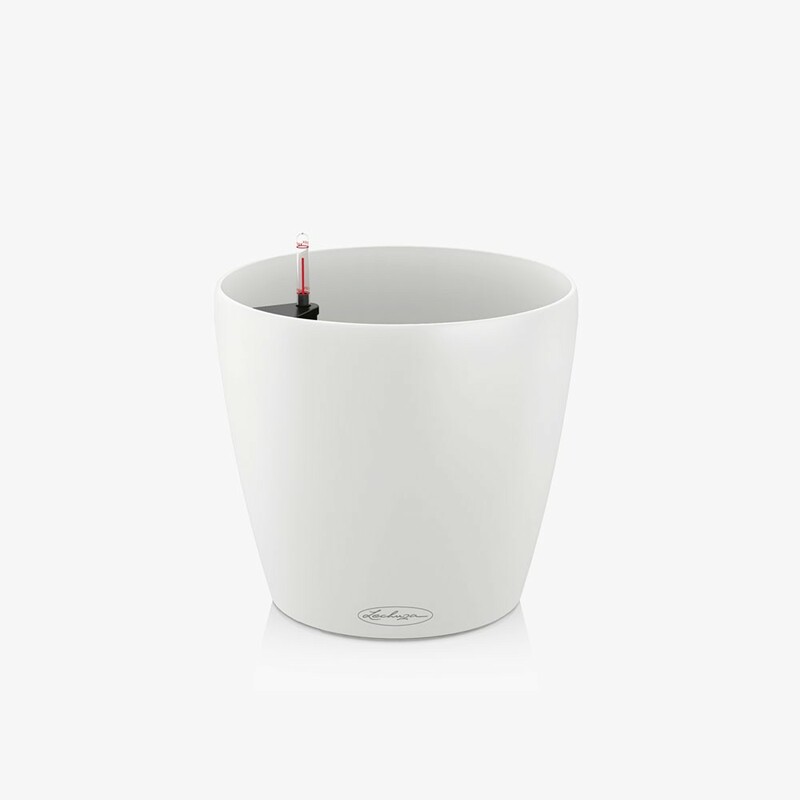 These modern indoor planters blend simple, elegant, lightweight design with natural tones and a textured finish. 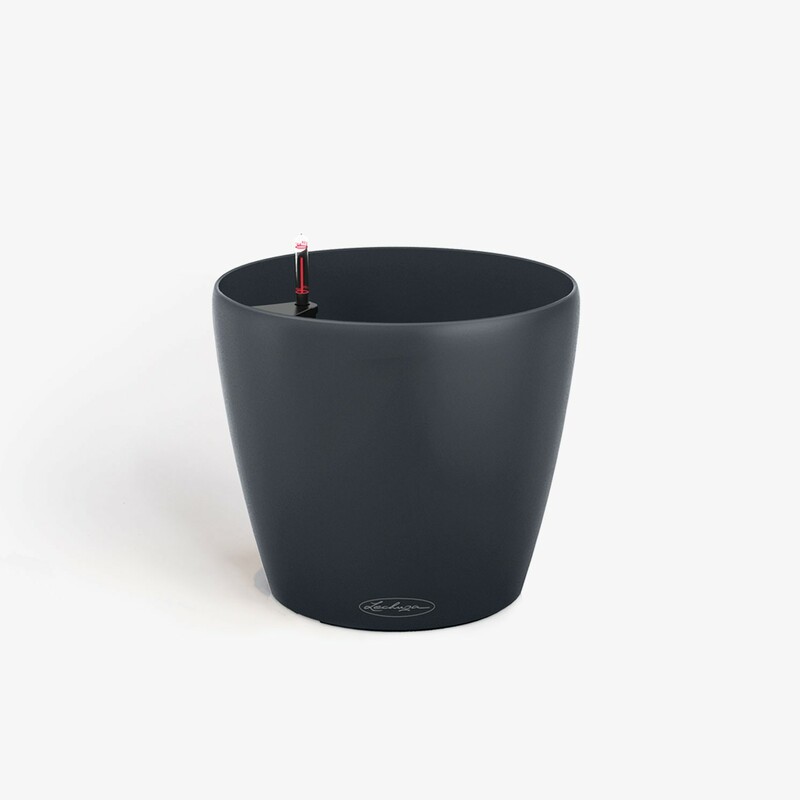 The Newport Planter is a tall, organic-shaped planter perfect for adding a little height to your plant of choice. Mold-cast, so there is a small seam evident on the sides on the planter. 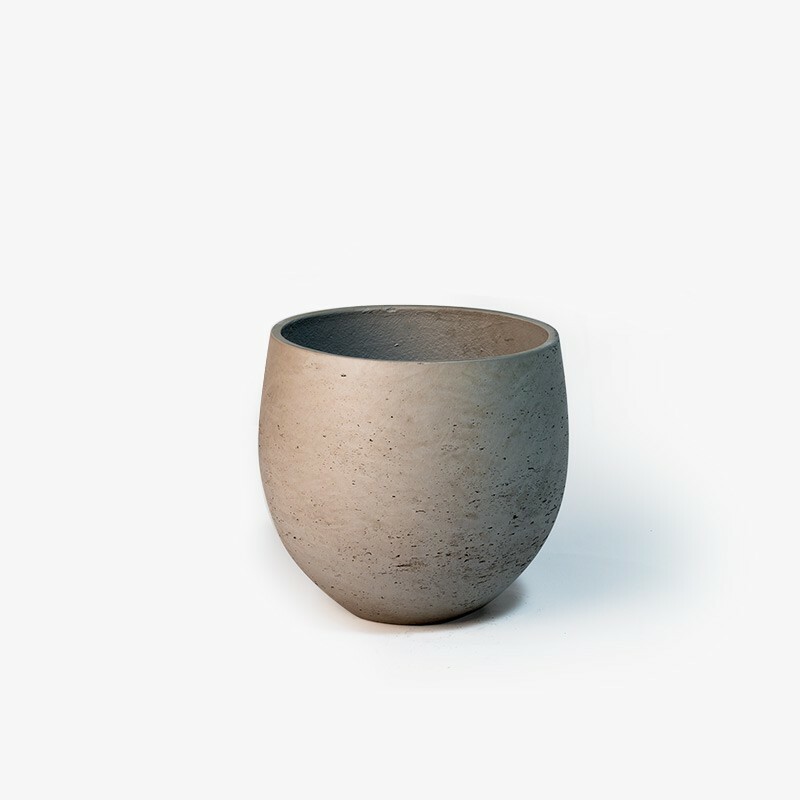 The Fiberstone Egg Planters are made from resin with fiberglass reinforcement. 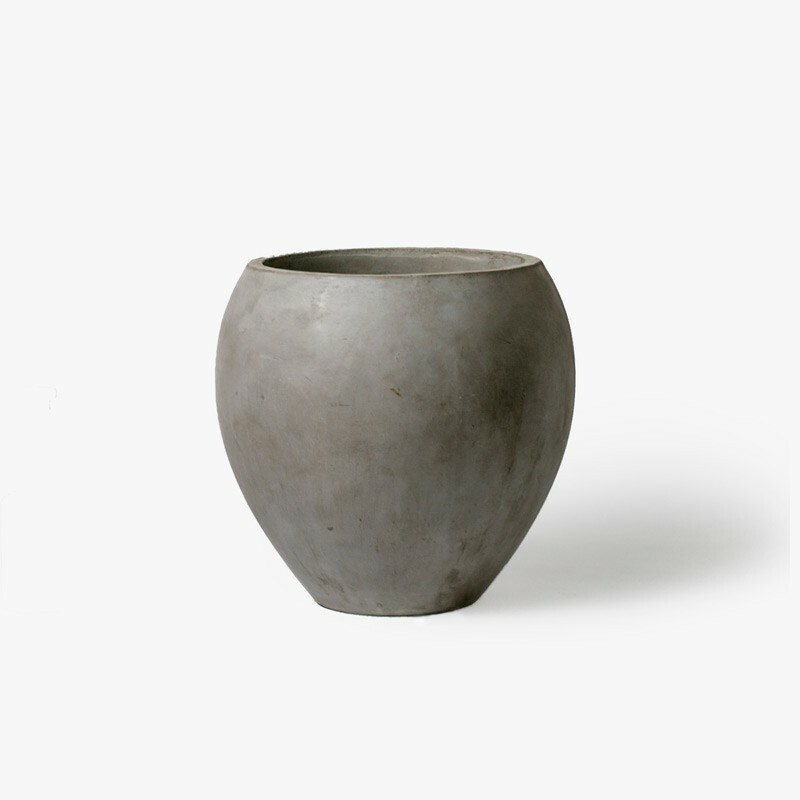 This classic pot design with a cement finish adds modern elegance to any space. 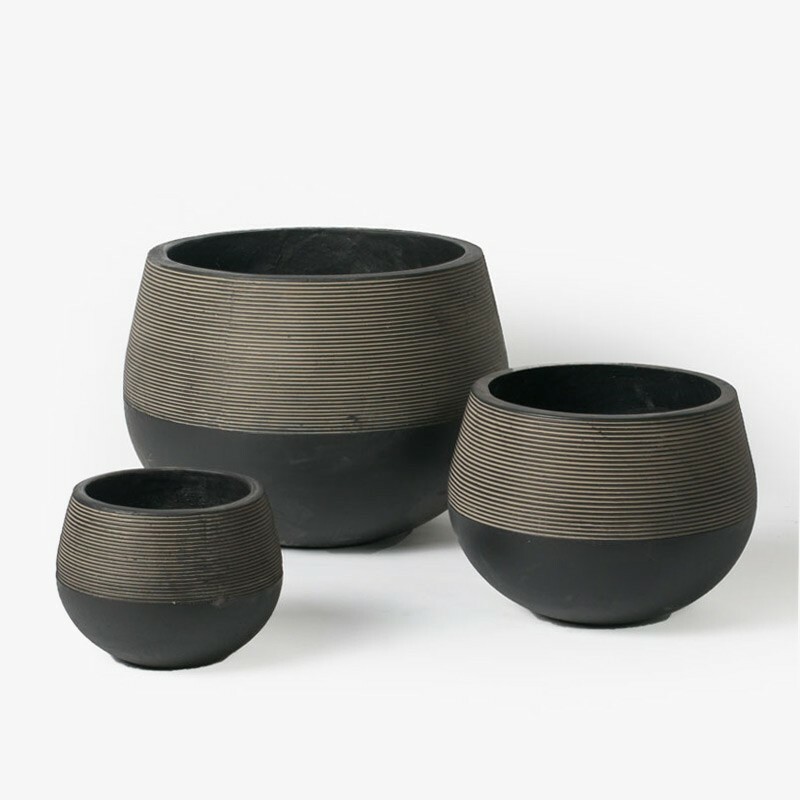 The Fiberstone Egg Planters are made from resin with fiberglass reinforcement. This classic pot design with a soft ivory finish adds modern elegance to any space. 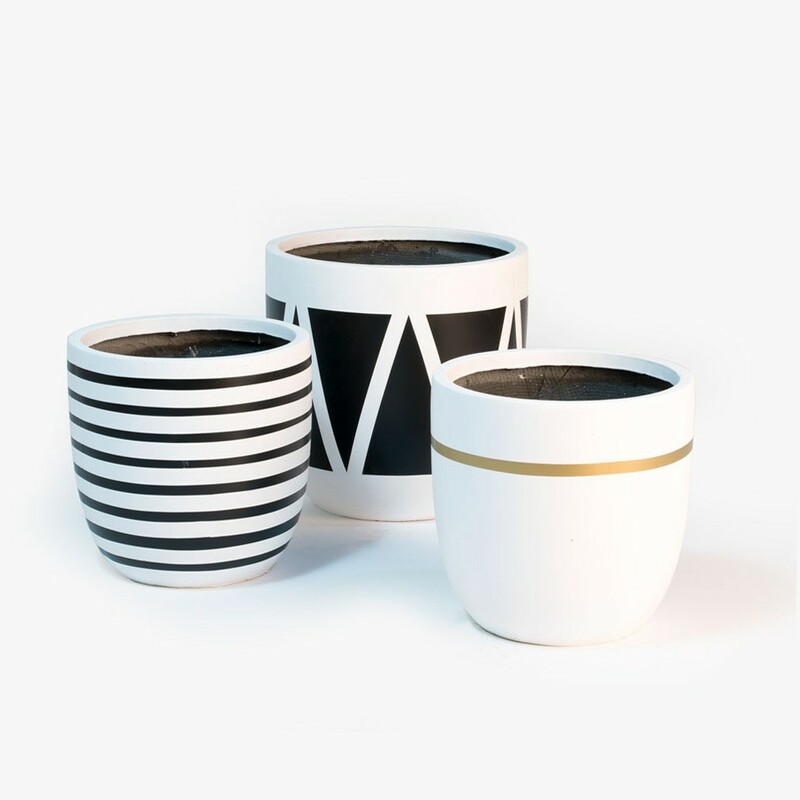 Founded by Mitchel Lindsay and Crystal Bailey in Sydney, Australia, Design Twins pots are lovingly hand-painted in their L.A. workshop. 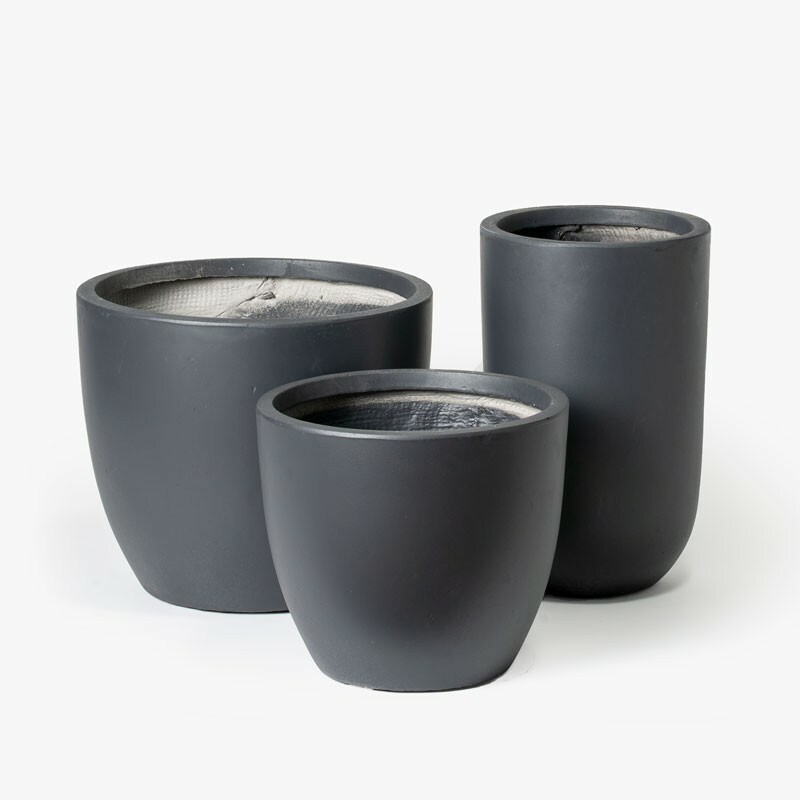 The perfect choice to add a little design flair into any space, these lightweight fiber-clay pots are certain to grab attention wherever they are placed. 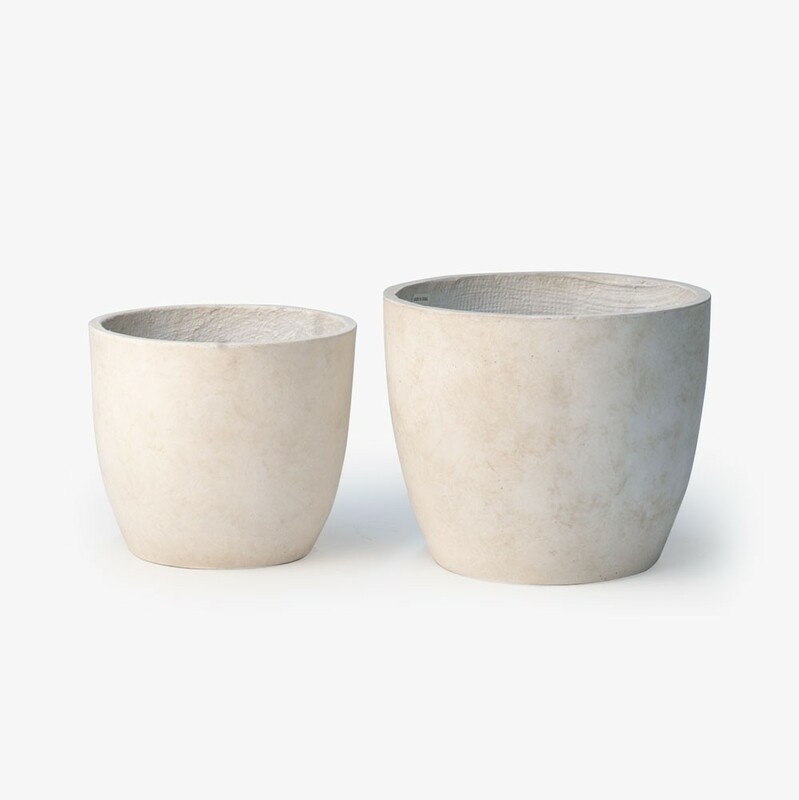 The Revolution Planters are made of light concrete, with decorative lines etched in the circumference of the planter. 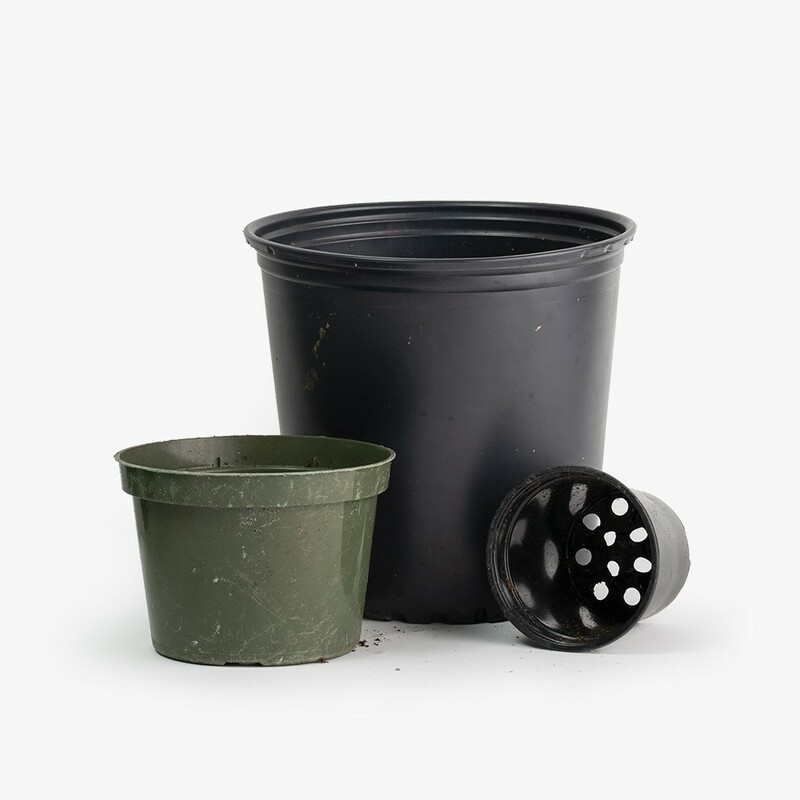 The Case Study Ceramics® Large Cylinder with stand is clean and elegant in form. 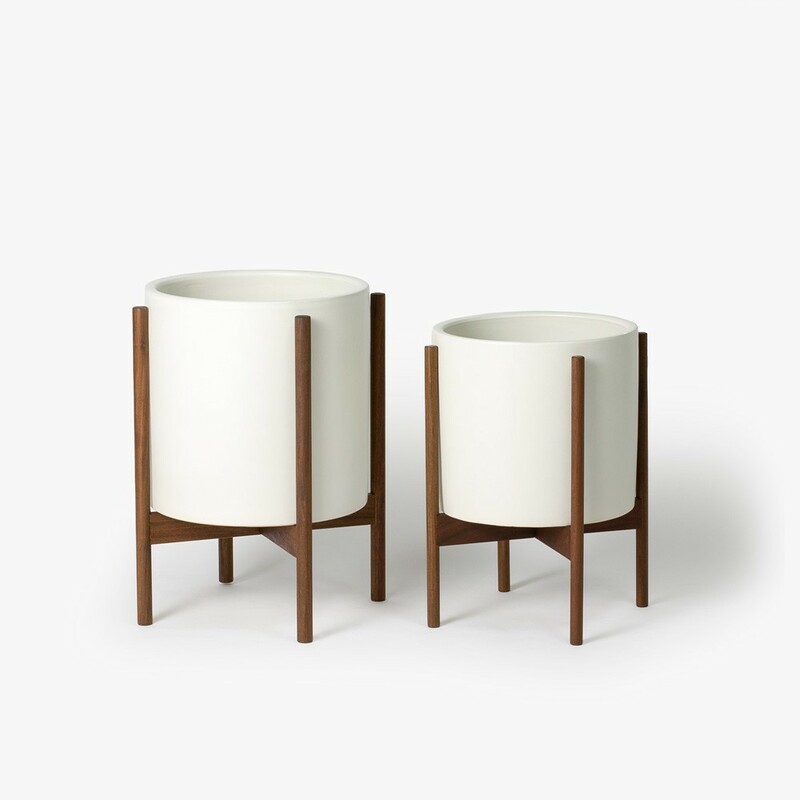 The stoneware planter is high fired and comes in two matte colors: charcoal and white. The stand is available in Brazilian walnut wood and powder-coated steel and is suitable for indoor and outdoor use. Greenery NYC offers next day delivery for orders placed before 12pm Monday through Friday. We do not deliver on Sundays, so orders placed Saturday will go out the following Monday. In case of inclement weather, we will automatically reschedule deliveries for the next day we deem safe for the health of the plant, and will send out a notification email with the updated schedule. Someone must be available to receive the delivery. If no one will be there to receive the delivery, you may give us permission to leave the plant outside the delivery address in the checkout notes. However we cannot acquiesce this request during the winter or in severe weather. If no one is there to receive the delivery and we are unable to leave it behind, a re-delivery fee will be incurred. Cancelled orders will incur a 20% restocking fee once they have been prepared for delivery. This is a high light plant. It will do best close to a south or west facing window, or directly against a east facing window. We do not recommend placing your Ficus Moclame in a north facing window. Bright indirect light. It will do best close to a well lit window, but just out of reach of the direct sunlight. This plant will not tolerate low light conditions. Be sure to water your plant upon delivery. Ficus Moclame prefer evenly moist soil. A thorough watering when the top 2" of soil are dry is ideal. This plant is sensitive to overwatering and susceptible to root rot. Please note, the Moclame may lose leaves when adjusting to a new space, however it should stabilize within a few weeks. If leaf drop persists contact our plant care consultant for assistance. Medium humidity. Place your plant away from hot or cold air drafts. This plant appreciates an occasional gentle misting. All floor plants have a 24 hour return window. We only send out plants that are representative of the photography on the site, and are confident you will be satisfied with your purchase. However, if your plant arrives damaged contact us at care@greenerynyc.com within 24 hours to initiate a replacement or refund. Please include your order number. If you are dissatisfied for any other reason such as plant size or shape, you are eligible for a swap of the same item within the 24 hour window at no cost. If you would like to initiate a return or swap for a different plant type, please note a 25% restocking fee will be incurred. Ficus Audrey Tree | 14"
Ficus Audrey Pole | 10"
Fiddle Leaf Fig Tree | 14"
Fiddle Leaf Fig Bush | 10"
Ficus Elastica Burgundy (Rubber Plant) | 10"